Salvage began soon after the sinking and continued into the 1950s. It is believed that she was dynamited as a navigational hazard and was used by the U.S. Army for aerial target practice after World War II. This is one of the most popular shipwreck dives in the Keys. 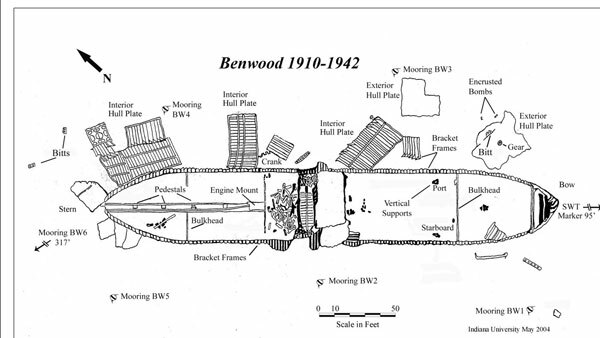 The remains of the Benwood are scattered over a wide area. The bow of the ship is the most-intact feature, forming a 25-foot profile in the water column. The hull structure is mostly intact up to the level of the first deck. Large steel knees join the deck plate to the outer hull and sides of the vessel. These knees are massive reinforced triangles of steel which outline the ship’s hull shape despite the loss of the hull plates themselves. Click here for a printable version of the Benwood site map. 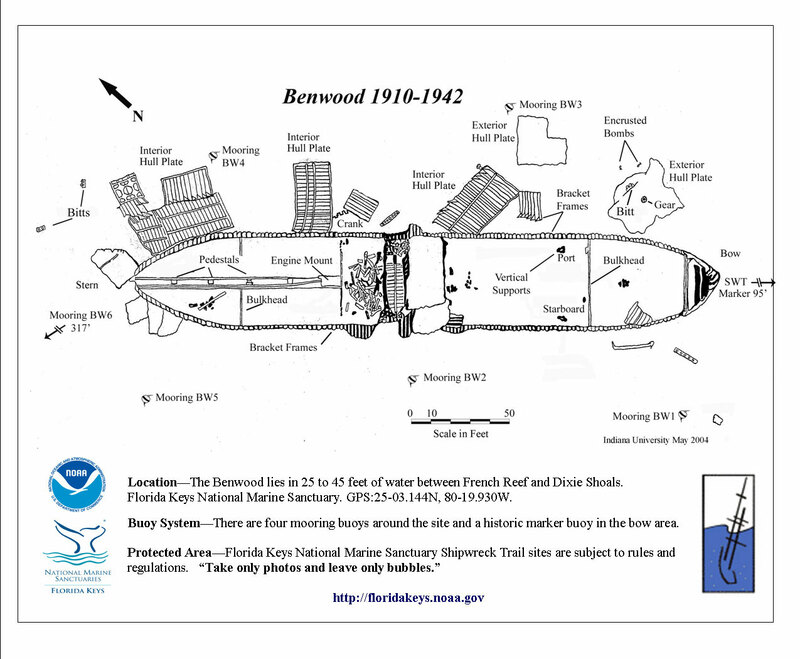 View a map showing the locations of buoys at the Benwood shipwreck site. Explore the ship's remains on the seafloor without getting wet! Click on the image below to start your dive. Images created in collaboration with The Ocean Agency. The image below activates a 3D model created using multi-image photogrammetry. Click the image to load the model, and then click, hold, and adjust your mouse to view the model from different angles. The photogrammetric model is composed of 6460 aligned images collected June 1, 2017 by scientific divers from FKNMS, Indiana University, and the Boy Scouts of America, with support from a NOAA Preserve America grant. The area modeled isabout 3070 square meters, with an estimated position error of 8.5 cm. Model and texture resolution were reduced for upload. Photography was processed by Matthew Maus, Indiana University.